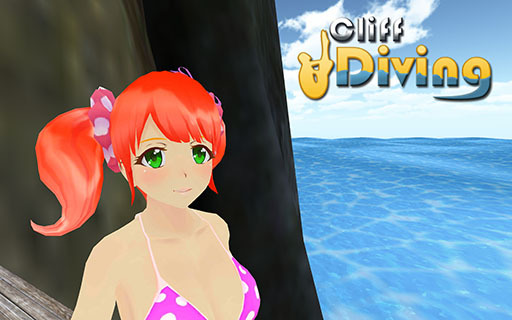 Cliff Diving is a challenging diving game for mobiles and the web. Brave the crashing waves, jagged rocks, and staggering heights to conquer Cathedral Rock! 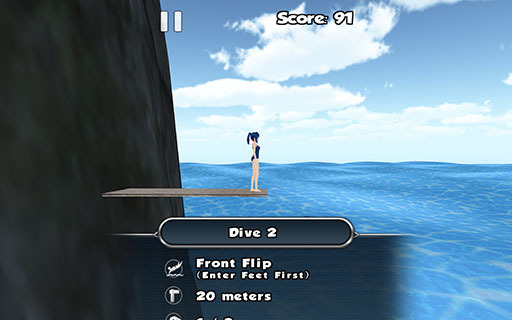 Dive from towering platforms into the turbulent sea below but be careful not to strike the cliff side. Perform perfect dives, pikes, and somersaults to advance to higher and higher platforms. Combine tricks and reckless abandon to score bonus points and top the leaderboards! Universal app - looks amazing on phones and tablets. Fun pick-up-and-play gameplay. Easy to learn but hard to master. Forward and reverse dives and flips. Pike and tuck dive positions can be combined in a single dive for bonus points. Convincing and fun physics engine makes for unpredictable falls should you hit the rocks on the way down! Expert mode to wring out the highest scores for competitive players. Play the world - online leaderboards. Even the ocean couldn't conquer Cathedral Rock. Can you?